Some Times Things consists of nine aluminum pipes. 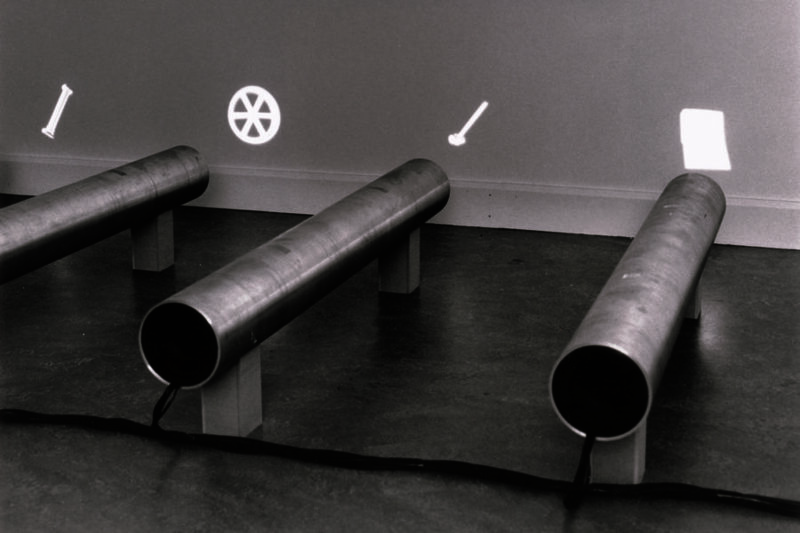 Each pipe contains a projection element at one end facing the wall and an audio speaker at the other, facing back into the viewer’s space. 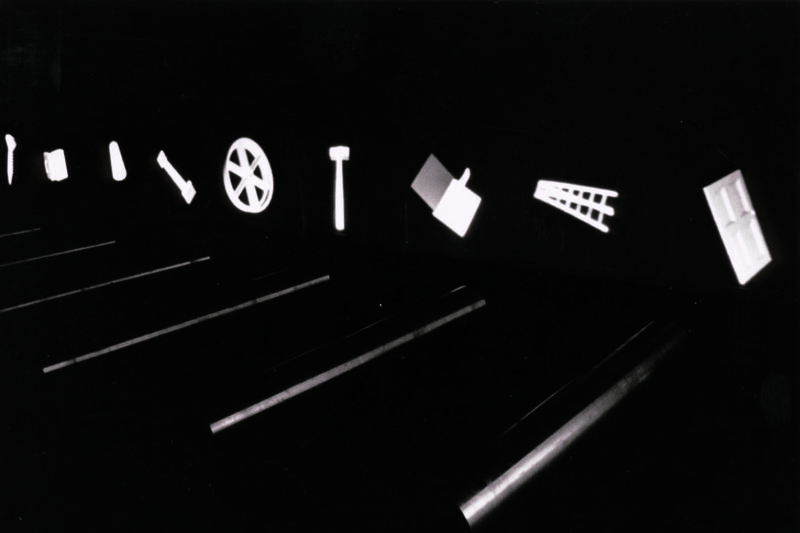 Black-and-white computer-generated images of everyday icons (screw, box, glass column, wheel, hammer, book, ladder, door) that slowly revolve on all three axes, are projected directly onto the wall. 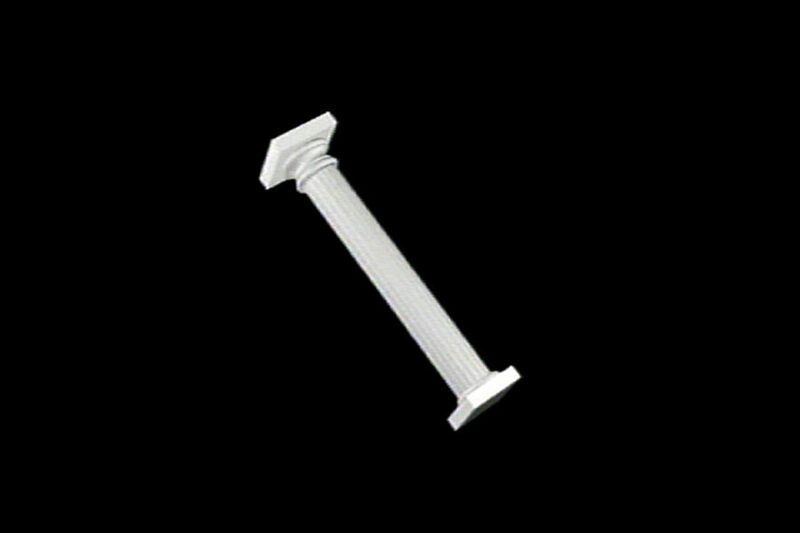 Each object is described in stereometric terms by a low voice heard from each tube. The room becomes a kind of ‘web’ of description with each droning voice decipherable only at close proximity. Perhaps becoming some kind of image bank for the future, the ‘scene’ now presents a kid of storage in which perpetual descriptions (lest we forget) are barely overheard. Gary Hill: Selected Works and catalogue raisonné. (Wolfsburg: Kunstmuseum Wolfsburg, 2002), GHCR 75, pp. 166 – 167. An example of this work was exhibited for the first time at the Musée d’Ixtelles, Brussels, Belgium, September 3 – November 30, 1992, as part of the exhibition “The Binary Era: New Interactions.” The exhibition traveled to Kunsthalle Wien, Austria, March 19 – May 19, 1993. Stedelijk Van Abbemuseum, Eindhoven, The Netherlands, December 5, 1992 – January 31, 1993. Gary Hill, Video Installations. Eindhoven: Stedelijk Van Abbemuseum, 1992, unpaginated. Binaera: 14 Interaktionen – Kunst und Technologie. 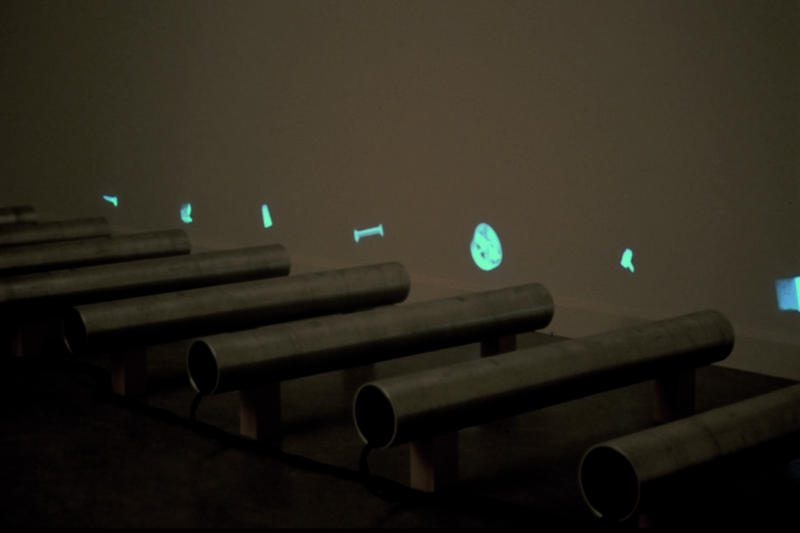 Ghent: Ludion; Vienna: Kunsthalle Wien, 1993, unpaginated. De Rijcke, Elke. “Dageraad of avondschemer over de video-installaties van Gary Hill.” Metropolis M 1 (1993), pp. 26, 27, 30. Bruce, Chris. Gary Hill. Seattle, Washington: Henry Art Gallery, University of Washington, 1994, pp. 16, 18 – 20, 32. Odin, Paul-Emmanuel. L’absence de livre [Gary Hill et Maurice Blanchot – Écriture, vidéo]. Marseille: La Compagnie, 2007, pp. 154 – 157, 203. Rotational symmetry S with respect to a line, except for two perpendicular indentations at a right angle and a helicoid surface of constant pitch and diminishing outer diameter. A surface, S-1, whose boundary consists of four line segments making up a rectangle, and a second surface, S-2, whose boundary is congruent to the boundary of the first surface, S-1. A tubular solid in the shape of one half of a thickened rectangle, attached to S-1. The two surfaces can be positioned such that they form a closed surface which bounds a solid rectangle. The part of a right circular cone between two planes perpendicular to the cone’s axis. A surface consisting of the lateral hull of a cone and a solid circle in one of the two limiting planes. The surface’s boundary is the circle in which the cone intersects the other limiting plane. A configuration that is symmetric. Cylinders and circles, both living by the fact that the distance between any of their points and another object is constant, for the cylinder the object being the axis, and for the circle, the center. Two right prisms close off the cylindrical solid. One circumscribing the latter. Solid cylindrical surface intersected by six rectangles passing through the surface’s axis, resulting in six 60-degree sectors. A pattern with few symmetries, obtained by thickening a polygonal skeleton, K. K consists of a longer line segment, AB, and a shorter segment, RS. They form a right angle, and the point of A is joined to the midpoint of RS. A part of RS is thickened to an octagonal solid. Two rectangles, gamma-1 and gamma-2, connected by a surface, beta. Beta is part of a right cylinder based on a plane curve of variable curvature. The angle between gamma-1 and gamma-2 is variable. Gamma-1 and gamma-2 bound a family of variably deformed surfaces. Two parallelograms, P-1 and P-2, in parallel planes, held together by a sequence of parallel rectangles, R-1, R-2, etc. Each R-1 is perpendicular to P-1. The median lines of P-1 and P-2 are parallel. Another two parallelograms, P-3 and P-4, held at constant distance by a sequence of line segments, D-1, D-2, etc. The median lines of P-3 and P-4 are parallel. A variable angle between the median lines of P-1 and P-3. Rectangle D in space with distinguishable faces. From reference point R on one of the sides, vector n is constructed perpendicular to D, with initial point at B, and pointing to the side of R. The position of D in space in uniquely determined by the location of R and the position of n. If a line of sight is perpendicular to n, then D appears as a line segment.